India has served as a major corridor for the dispersal of human beings that started from Africa about 100,000 years. Though the date of entry of modern humans into India remains uncertain, evidence from archaeological studies suggest that by the middle paleolithic period (50,000-20,000 years before present (ybp), humans appear to have spread to many parts of India. Molecular genetic evidence also supports the fact that a major population expansion of modern humans took place within India. The time of this demographic expansion has been speculated to be about 60,000-85,000 ybp (Mountain et al. 1995). Contemporarily, there is an extensive social, cultural, linguistic and biological diversity in the Indian population, nurtured to a large extent by the varied topography of the country. The vast majority of the people of India (~80%) belong to the Hindu religious fold. Hindus are hierarchically arranged into 4 socio-cultural clusters of groups (castes) and there are set rules governing marriage within the Hindu religious fold. About 8% of the population is constituted by tribals, who are ancestor worshippers and are largely endogamous. The remaining belongs to other religious groups, including Muslims, Christians, Buddhists, Jews, etc. Primarily, marriages occur within the religious groups. In addition, language and geographical location of habitat, serve as barriers to free gene flow. These factors have resulted in the formation of a several thousand endogamous groups in India. Indian population, comprising of more than a billion people, consists of 4693 communities with several thousands of endogamous groups, 325 functioning languages and 25 scripts. In some geographical regions of India, inbreeding is practiced. The population inbreeding coefficient in India varies from 0.00-0.20. Besides, different waves of migration have led to admixture of different ethnic groups, cultures and languages, with the native population, thereby contributing significantly to the present day gene pool of the subcontinent. With the exception of Africa, such an extent of genetic diversity is not observed in comparable global regions. Indian population can be, to a large extent, substructured on the basis of their ethnic origin as well as linguistic lineages. All the four major morphological types- Caucasoid, Mongoloid, Australoid and Negrito, are present in the Indian population (Malhotra 1978). The "Caucasoid" and "Mongoloid" populations are mainly concentrated in the north and northeastern parts of the country. 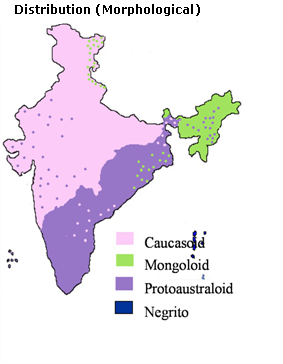 The "Australoids" are mostly confined to the central, western and southern India, while the "Negritos" are restricted only to the Andaman Islands (See Morpho Map) Linguistically, Indian populations belong to four major language families: Indo-European, Dravidian, Tibeto-Burman and Austro-Asiatic. 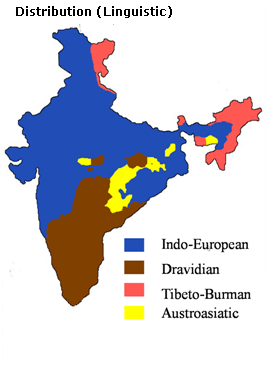 The Indo-European and Dravidian languages are spoken in the northern and southern parts of the subcontinent, respectively (See Linguistic Map). The Tibeto-Burman speakers are supposedly immigrants to India from Tibet and Burma (now, Myanmar) and are concentrated in the northeastern parts of the country. The Austro-Asiatic speakers are exclusively tribals and are dispersed mostly in the central and eastern parts of the country. Molecular diversity studies have revealed that the Austro-Asiatic speakers are likely to have been the most ancient inhabitants of India. Allchin B, Allchin R (1982) The Rise of Civilization in India and Pakistan. Cambridge University Press, Cambridge. Bamshad M, Kivisild T, Watkins WS, Dixon ME, Ricker CE, Rao BB, Naidu JM, Prasad BV, Reddy PG, Rasanayagam A, Papiha SS, Villems R, Redd AJ, Hammer MF, Nguyen SV, Carroll ML, Batzer MA, Jorde LB (2001) Genetic evidence on the origins of caste populations. Genome Res 11: 994-10004. Bamshad MJ, Watkins WS, Dixon ME, Jorde LB, Rao BB, Naidu JM, Prasad BV, Rasanayagam A, Hammer MF (1998) Female gene flow stratifies Hindu castes. Nature 395: 651-652. Basu A, Mukherjee N, Roy S, Sengupta S, Banerjee S, Chakraborty M, Dey B, Roy M, Roy B, Bhattacharyya NP, Roychoudhury S, Majumder PP (2003) Ethnic India: a genomic view, with special reference to peopling and structure. Genome Res 13: 2277-90. Bhasin MK, Walter H, Danker-Hopfe (1994) People of India: An Investigation of Biological Variability in Ecological Ethnoeconomic and Linguistic Groups. Kamla-Raj Enterprises, Delhi. Bhattacharyya NP, Basu P, Das M, Pramanik S, Banerjee R, Roy B, Roychoudhury S, Majumder PP (1999) Negligible male gene flow across ethnic boundaries in India, revealed by analysis of Y-chromosomal DNA polymorphisms. Genome Res 9: 711-9. Bittles AH (2002) Endogamy, consanguinity and community genetics. J Genet 81: 91-8. Bittles AH & Neel JV (1994) The costs of human inbreeding and their implications for variations at the DNA level. Nature Genet 8: 117-121. Cann RL (2001) Genetic clues to dispersal in human populations: retracing the past from the present. Science 291: 1742-8. Gadgil M, Joshi NV, Prasad UV, Manoharan S, Patil S (eds) 1998 in The Indian Human Heritage. Universities Press, Hyderabad, pp 100-29. Gadgil M, Guha R (1992) The Fissure Land: An Ecological History of India. Oxford University Press, New Delhi. Guha BS (1935) The racial affinities of the people of India; in Census of India, 1931, Part III ? Ethnographical. Government of India Press, Simla. Kivisild T, Rootsi S, Metspalu M, Mastana S, Kaldma K, Parik J, Metspalu E, Adojaan M, Tolk HV, Stepanov V, Golge M, Usanga E, Papiha SS, Cinnioglu C, King R, Cavalli-Sforza L, Underhill PA, Villems R (2003) The genetic heritage of the earliest settlers persists both in Indian tribal and caste populations. Am J Hum Genet 72: 313-32. Kukreti R, C BR, Das SK, De M, Talukder G, Vaz F, Verma IC, Brahmachari SK (2002) Study of the single nucleotide polymorphism (SNP) at the palindromic sequence of hypersensitive site (HS)4 of the human beta-globin locus control region (LCR) in Indian population. Am J Hematol 69: 77-9. Majumder PP (1998) People of India: Biological diversity and affinities. Evol Anthrop 6: 100-10. Majumder PP (2001) Ethnic populations of India as seen from an evolutionary perspective. J Biosci 26: 533-45. Majumder PP, Roy B, Banerjee S, Chakraborty M, Dey B, Mukherjee N, Roy M, Thakurta PG, Sil SK (1999) Human-specific insertion/deletion polymorphisms in Indian populations and their possible evolutionary implications. Eur J Hum Genet 7: 435-46. Malhotra KC (1978) Morphological composition of the people of India. J Hum Evol 7: 45-63. Malhotra KC & Vasulu TS (1993) Structure of human populations in India. In: Majumdar PP (Ed.) Human Population Genetics : A Centennial Tribute to J.B.S. Haldane. Plenum Press, New York, pp 207-233. Mishra S (1992) The age of the Acheulian in India: New evidence. Curr Anthropol 33:325. Misra VN (1992) Stone age in India: an ecological perspective. Man Env 14: 17-64. Misra VN (2001) Prehistoric human colonization of India. J Biosci 26: 491-531. Mountain JL, Hebert JM, Bhattacharyya S, Underhill PA, Ottolenghi C, Gadgil M, Cavalli-Sforza LL (1995) Demographic history of India and mtDNA-sequence diversity. Am J Hum Genet 56: 979-92. Rao PSS (1984) Inbreeding in India: Concepts and consequences. In: Lukacs JR (Ed.) The People of South Asia. New York, Plenum Press. Pp 239-268. Roy B, Majumder PP, Dey B, Chakraborty M, Banerjee S, Roy M, Mukherjee N, Sil SK (2001) Ethnic differences in distributions of GSTM1 and GSTT1 homozygous "null" genotypes in India. Hum Biol 73: 443-50. Roy S, Thakur Mahadik C, Majumder PP (2003) Mitochondrial DNA variation in ranked caste groups of Maharashtra (India) and its implication on genetic relationships and origins. Ann Hum Biol 30: 443-54. Roychoudhury S, Roy S, Basu A, Banerjee R, Vishwanathan H, Usha Rani MV, Sil SK, Mitra M, Majumder PP (2001) Genomic structures and population histories of linguistically distinct tribal groups of India. Hum Genet 109: 339-50. Singh KS (2002) People of India: Introduction National Series. Anthropological Survey of India-Oxford University Press, Delhi. Thangaraj K, Ramana GV, Singh L (1999) Y-chromosome and mitochondrial DNA polymorphisms in Indian populations. Electrophoresis 20: 1743-7.